It's Friday, Boy do the weeks fly by!! Goes to show we must be having fun! This week we're featuring Beth from Love Laugh Quilt. Beth is a quilting super woman. She makes beautiful quilts at the speed of light, leaps mountains of fabric in a single jump and blogs almost every day. Her work is sometimes wonky or liberated , sometimes traditional and it is always beautiful. It was Beth who inspired my love my house blocks when she hosted a house block swap/giveaway a few years ago. She put a call out for house blocks which she then bundled up and gave to various lucky winners. (Karen of Sewing Tales from last weeks Friendly Friday was one of the winners!) I didn't win but I really enjoyed making some blocks and watching all the house blocks flood in from around the world. I loved how different each block was even though it was the same theme. Ever since I've always kept an eye out for house blocks of all types. "I've been sewing since I was a little girl. I began making dresses for the dolls and then joined 4-H where we learned to sew clothing for ourselves. I also took sewing classes in school. Sewing is very practical thing to know how to do. I've always been able to make new curtains for the house and little pillows for the sofa. I've been quilting non-stop for about 5 years now. Everyone I'm related to has a quilt!!! I love giving quilts away and I LOVE creating. There are TWO quilters that live inside of me. The one that wants to give a simple quilt to show I care....and the one that wants to spend the WHOLE day making an art quilt.....JUST because! I use two machines. I have a JUKI that I love using to quilt my quilts and I sometimes use a featherweight." 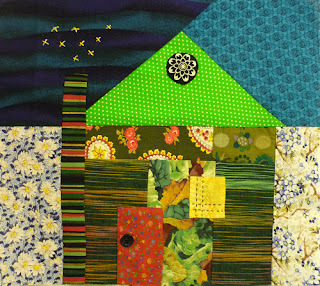 "Your little house block was fun to make using scraps from this and that! Hope you enjoy the happy colors!" ... and the sparkly sparks showing that there is a warm welcoming fire in the hearth. If you've never visited Beth's blog Love Laugh Quilt then I can highly recommend making a nice cup of tea and having a good read of her enjoyable posts. They always make me want to run to my sewing room and get sewing. Super fun weekend to everyone!! Heavens how much fun are all those blocks and the house reminds me of wandering past and desperately wanting to peep in, now Im popping over to ooh and ahh at Beths blog. Sparkles from a warm fire in the chimney is so cute. Another wonderful Friday visit. Are you dreaming of HST's? Great block and I love the green roof! 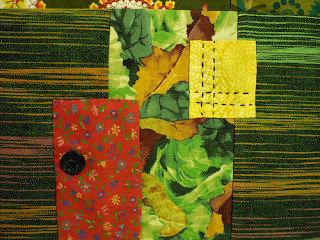 I have followed Beth's blog for a long time and she is a very warm person and a great quilter! I really like that chair quilt too! Love Beth's quilting! Another fantastic interview! Speed of light.. yes that she is when it comes to quilting. I have known her through blogland for a while, She is so kind and funny. Love the block she made for you. I'm a big fan of Beth, too. I love love love her house block with the embroidery & appliqués. And I don't remember seeing that floral bear's paw! I'm off to look though her Flickr! Wow!!! Beth is amazing!!! You're right... I need to make a cup of tea and spend some time looking at her blog!!! love her blocks! my favorite bit is the stars above the chimney = too darling and makes me miss my winter fires! The little bits of embellishment make this house block truly special. Love all the attention to detail. Thanks so much for introducing Beth to me! Her work is unique and inspiring! Beth is also one of my favorite blog friends. All of her quilts are fresh and happy. Her comments are warm and encouraging. And she's always a good sport when it comes to group projects. Beth is one of my favorite bloggers. She turns out lots of great quilts. A very sweet, kind and generous lady. She IS amazing and I LOVE following her. Thanks for featuring Beth. She is one of my favorite quilting bloggers. So is the lady above me. But honestly Beth makes and gives away so many quilts and blocks, gathers blocks from us bloggers and makes them into quilts for donation and has her annual house block giveaway.....one of these years I'm gonna win :0). but even if I don't Beth makes it all fun for us. And how does she do it all with kids at home! 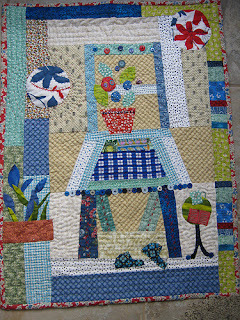 Great house block and I love Beth's pieced chair mini too. It's such fun seeing every Friday, each of these fabulous house blocks, and how they are all so different. Another fun post Rachael...and what a great fun house block...I think I need some inspiration here as I've got a cough and just can;t get into it...Have a lovely rest of the weekend! I have followed Beth's blog for a while and her output is amazing. 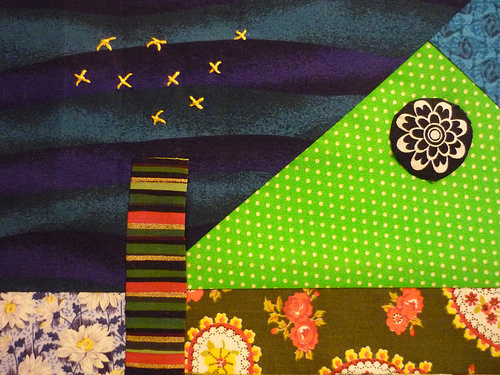 I just love the diversity of her quilts. She is a very generous quilter. I love the things Beth gets up to and she did a great house block for you. I didn't know she'd only been quilting five years, she's very accomplished. Hi, Rachael. Beth does such interesting and fun stuff. I like your features--they're well put together with a nice selection of quilts. Bravo! Thanks so much for these Friendly Friday posts! It's great to get to know some familiar quilt bloggers better and meet some new ones! Brilliant idea!